Do you have a passion for sustainable transportation? Do you love working with awesome, energetic coworkers? Green Action Centre is the place for you! Green Action Centre is now recruiting for a Sustainable Transportation Project Coordinator. The ST Project Coordinator is a multitasking individual that oversees our annual commuter events, such as The Commuter Challenge and The Jack Frost Challenge. They work closely with all staff to promote and expand current programs, such as GoManitoba and helps guide our sustainable programming. For more information, read the full Job Advertisment below, and as always, feel free to share with your networks. Term: 9.5 month term at 35 hours per week, with a likely extension beyond July 2019. 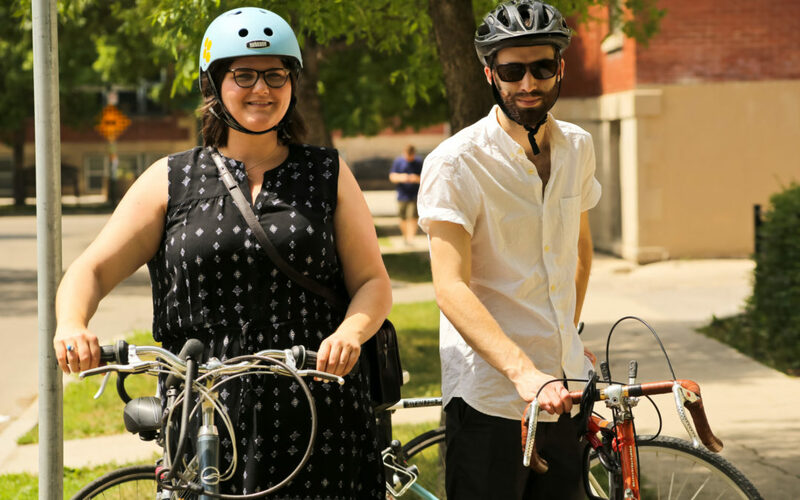 The position is shared between two sustainable transportation program areas: 3-4 days/wk as the Commuter Challenge Coordinator, and 1-2 days/wk with Workplace Commuters Options. Position Description: Green Action Centre seeks an independent, energetic and well-organized individual to fill a dual role within our sustainable transportation team. The coordinator will organize and promote our annual Commuter Challenge event in June and our Bougeons en hiver: The Jack Frost Challenge in February. The Coordinator will also assist with the delivery of our Workplace Commuter Options program (WCO), which includes our provincial wide ride-matching tool, GoManitoba. The position will focus on engaging businesses, employees and community organizations to make active and green transportation options both appealing and within reach for workplaces and employees, ultimately reducing Manitoba’s GHG emissions from drive alone travel by increasing walking, cycling, public transit and car pooling as preferred modes of travel for Manitobans. Background: Green Action Centre is an environmental, non-profit organization, based in Winnipeg and serving Manitoba. We are a registered charity, governed by an elected board of directors, with a core group of passionate, dedicated staff. We promote greener living through environmental education and encourage practical green solutions for households, workplaces, schools and communities. Our primary areas of work are green commuting, composting and waste reduction, sustainable living, and resource conservation. We also run a social enterprise, Compost Winnipeg, which collects commercial and residential organic waste in Winnipeg. We are located on Portage Avenue in the heart of downtown, and are part of the EcoCentre on the 3rd floor of the Mountain Equipment Coop Building. Work with the team to coordinate and deliver workshops, presentations, half-day training sessions and keynote speaker events tailored to workplace ambassadors from a variety of organizations, specifically sustainability, wellness and HR managers; program content focused on Transportation Demand Management (TDM) initiatives, transit tools, bike route planning, site assessment, and behavioral change theory. Staff displays and deliver presentations, including participation in events put on by Bike Week, the Winnipeg Chamber of Commerce, the Downtown BIZ, etc. Term Position: Starts November 2018 and ends July 15, 2019 with likely extension subject to mutual agreement between the parties and the status of project funding. This position reports directly to the Executive Director. Remuneration: $19.75 per hour (35 hrs/wk). A monthly Winnipeg Transit EcoPass is also provided as part of Green Action Centre’s “Active Transportation Benefit” policy. Deadline: Resume and cover letter must be received by 4:00 p.m. CDT, October 10, 2018. To Apply: Applications will be accepted until the deadline by e-mail only. If this opportunity interests you please email your cover letter and resume to info@greenactioncentre.ca with “Sustainable Transportation Coordinator” in the subject heading. For more information on Green Action Centre and our programs, please explore our website at www.greenactioncentre.ca. I’m interested in the Sustainable Transportation Project Coordinator position. Just wondering who I should address my cover letter to. Thanks for the interest Jane! You can address it to me, Jaret Olford, and I will be sharing with the hiring committee. Thanks again and look forward to receiving it! Send to info@greenactioncentre.ca.